Your skin faces a lot each day- dirt and pollution, the weather, air-conditions, even a lack of sleep and eating on the go. In the short term, these things can lead to dry patches, redness, blemishes and cause your skin to feel sensitive. In the long term, you’d be surprised but it can increase the sensitivity of your skin, and even cause premature aging! The primary purpose of the skin is protection; it provides a physical barrier against radiations and other harmful pollutants and chemicals. In carrying out this function, the skin encounters inevitable harm which leads to the signs of skin aging wrinkles, fine lines, altered pigmentation, loss of volume and skin tone. 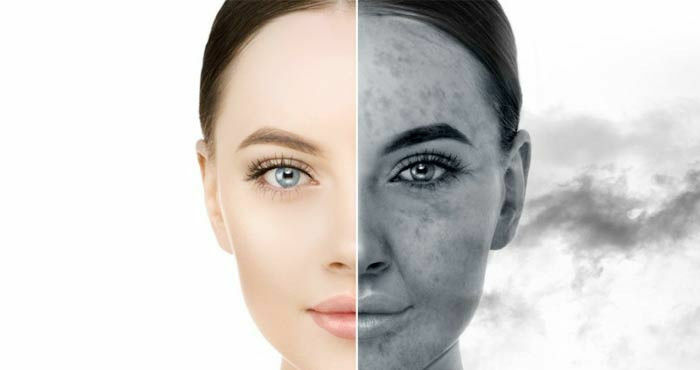 We know that both internal and external factors lead to skin aging internal factors include smoking and excess alcohol, and external factors include sun exposure through UV radiation and air pollution. Things like exhaust fumes, smoke, and dust – these can leave your skin feeling irritated and grimy when you live or work in the city. Throughout the course of the day pollution in the air sticks to your skin and is absorbed by the skin’s natural barrier. Over time, it can irritate and weaken the skin’s natural barrier, which means it can no longer do its job properly and leaves your skin feeling more sensitive. Exposure to air pollution depletes antioxidants that protect the skin from acne and aging. "This [air pollution] is not going to go away. This is not a problem that is easily fixed," but we take precautions to prevent our skin from having skin damages. Protect your skin from the damaging effects of the sun by slathering a broad spectrum sunscreen onto your skin. Know your needs when it comes to skin care. Derma Essentia Sunscreen Gel is filled with pollution-fighting ingredients and antioxidants. A natural polysaccharide, Biosaccharide Gum-4 in derma essentia sunscreen gel forms a breathable layer over the skin that protects it from major pollutants like car exhaust, smog, dust, and dirt, thus reducing wear and tear to your looks.